The quote that is the title of this post is taken from a new movie called ‘Watershed‘. I just heard about this movie this week and the timing is perfect, as the photos in this gallery, and the ones from the previous post Adams Falls mark the first pictures of water that doesn’t end up in the Gulf of Mexico that I’ve taken for this project. 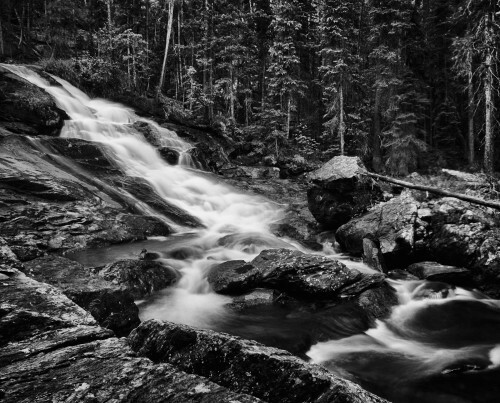 Both Adams and East Inlet Falls are on the western slope of Rocky Mountain National Park and their water soon joins the Colorado River, the subject of Watershed. It is depressing to think of what this water will go through as it flows through the southwest. It will get stuck behind massive concrete dams that fill canyons. It will be pulled out to water the superfluous golf courses that litter the dessert. And, most depressing of all, it won’t even make it to the ocean. The Colorado River no longer drains the american continent. It dries out and sinks beneath the sands short of the Sea of Cortez. At one time 80% of the riparian habitat along the entire Colorado River was clustered around the non-existant mouth of the Colorado River, so as the tagline for this project states ‘Water is life’ and for the Colorado River, that life is fading. I’m already planning another trip to the falls on the western side of Rocky Mountain National Park in the coming month, and will have a lot more to say about where all that water now goes in the future.